Something to Consider: How Much Should We Share? Most educators recognize the importance of developing their students’ voice. One underappreciated aspect of helping young people find their voice is helping them become aware of the consequences of sharing particular details of their stories. For many, being heard, and listened to with respect, can be a transformational experience. This is especially true when you have been made to feel invisible. At Re-Imagining Migration, we have seen how being listened to leads to student engagement. At the same time, we must recognize that some of our students may have complicated histories that are part of their story or their families’ story. They should be conscious of their decision to share or not to share those details. Some students may have traumatic histories that they are not quite ready to discuss or relive. Other students may not have proper authorization to be in the country or have family members without legal paperwork. Students should be very careful in thinking about whether or not to share those details out loud, among their peers; essential is the issue of how trustworthy is the context of sharing. They should be honored and provided full respect to reveal only as much as they feel they wish (and are ready) to disclose. They must not be pushed to speak out loud further than they are ready. Students should be allowed to write or draw or express themselves as they are most comfortable and not penalized by reticence (either by shaming or grading). Make sure there is a list of people to talk to in case issues arise including the school guidance counselor, social worker, clergy, or other trusted adults. Harvard University Scholar Danielle Allen has been studying social change in the digital age for over eight years. Prof. Allen in her team have encountered powerful examples of storytelling. Their research led to the creation of the Ten Questions for Changemakers project. 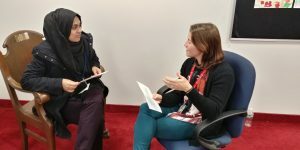 In that work, she and her team developed ten questions that they believe can help Changemakers design effective solutions to challenging social problems. One question they ask change makers to reflect upon is, “how much should I share?” The question is deceptively simple and incredibly relevant in the digital age. Online information can leave a footprint that others can follow if they seek to know more about you. As students prepare to be interviewed by a classmate, encourage them to think, ahead of time, about the question, how much should I share? Have students consider the advantages and disadvantages of sharing different parts of their stories publicly. We believe sharing our stories can be empowering, but we want students to be thoughtful about their own actions. Sharing some stories can put us at risk, or stir up trauma. If students haven’t thought about this question ahead of time, they can sometimes feel unprepared or put on the spot. You can have students write their responses in a journal. Some may wish to share their thinking about this question in pairs or small groups, whereas, in other classrooms, teachers may want to keep this as a solo activity. This page is part of our Moving Stories educators guide, use this link to learn more. *Note: We have anticipated this dilemma in the design of The Moving Stories app. The settings allow users to upload or not upload the interview, and includes a variety of sharing settings. 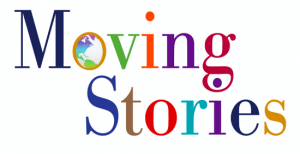 There are is also a feature that allows educators to create password protected story-sharing areas on the Moving Stories website.